It was clear early on that Frank Robinson was going to be a star. When he tried out for an American Legion team at North Oakland's Bushrod Park as a 15-year-old, he hit a home run in his first at bat. "He was what we call a man-child athlete," said Paul Brekke-Miesner, a local sports historian and author of "Home Field Advantage," a book about Oakland-bred athletes like Robinson. "Certain players, their talent is just so head and shoulders above their competitors that they stand out. And Frank was one of those guys." Robinson, who grew up in West Oakland and died on Thursday at the age of 83, more than fulfilled that early potential. He ranks 10th on the all-time home run list and is the only person to win baseball's Most Valuable Player award in both leagues. 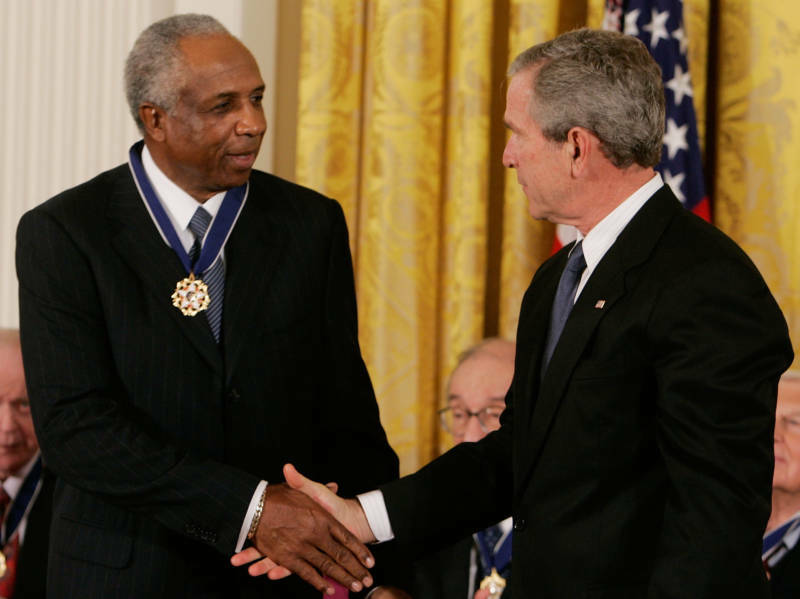 On top of that, he was the first African-American manager in both leagues (including a four-year stint with the Giants in the early '80s), a Hall of Famer and a recipient of the Presidential Medal of Freedom. But one could argue that he wasn't even the best athlete in his high school class. "It's a pretty incredible story," Brekke-Miesner said. 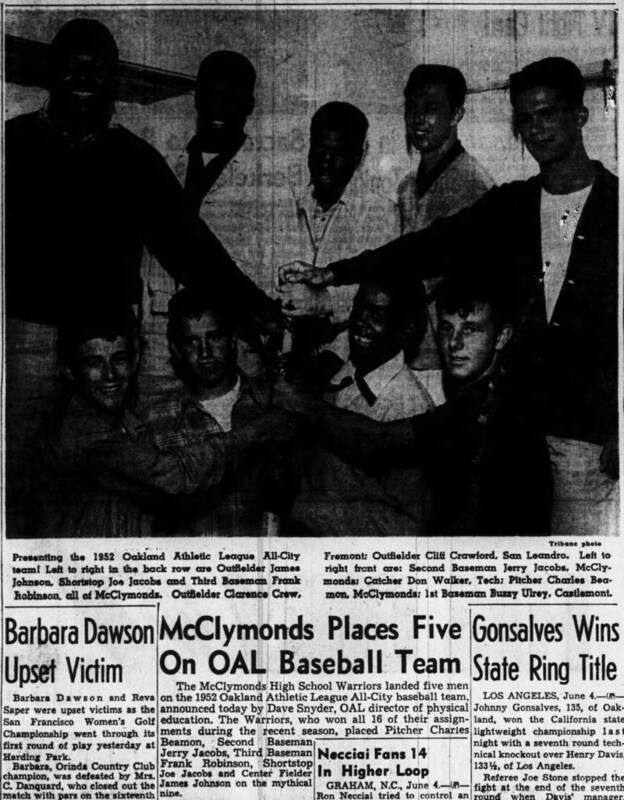 It was the 1951-52 school year, and Robinson played baseball and basketball for McClymonds High School. On the basketball team, he was joined by Bill Russell, almost universally regarded as one of the greatest basketball players in history. Russell won 11 NBA titles, five MVP awards and was the first African-American head coach in any U.S. professional sport. He also has his own Presidential Medal of Freedom. And on the baseball team, Robinson shared the diamond with Curt Flood, one of the best center fielders of all time and the reason that professional athletes today can become free agents. In 1970, Flood — a three-time all-star and seven-time Gold Glove winner — challenged what was known as baseball's reserve clause, which prevented a player from signing with another team even after their contract expired. The Supreme Court ruled against Flood in 1972, but his case pushed the conversation forward, and in 1975, baseball abolished the reserve clause. "Imagine one high school year, one neighborhood that produced those three who went on to do incredible things in the world of sports," Brekke-Miesner said. Robinson and Flood helped McClymonds go undefeated that year, and Robinson and Russell's basketball team won the coveted Tournament of Champions, the de facto state championship. All three legends pointed to their coach at McClymonds, George Powles, as one of the greatest influences in their lives, both as athletes and human beings. Powles was the first person Robinson thanked in his 1982 Hall of Fame induction speech. He said Powles taught him to play the game the "right way," to always give 100 percent and also how to accept defeat and build from it. "George Powles gave me the foundation I'm still building on," Robinson told the crowd in Cooperstown, New York. "I want to say to George Powles, 'Thank you for all the youth of Oakland,' because I know they appreciate it like I did and still do." "He was just one of those amazing coaches and had a powerful impact on all three of them," Brekke-Miesner said of Powles. Even before coming across Powles as teenagers, Brekke-Miesner said young athletes in Oakland like Robinson, Russell and Flood had access to an excellent park and recreation system. Bushrod Park was a haven for baseball stars like Robinson and Flood, and Russell played pick up games on the basketball courts at de Fremery Park. Brekke-Miesner also pointed to an early 20th century agreement between the city and the school district to put a male and female playground director at every elementary school playground. "That experience on the playgrounds of Oakland over the years was typically the first coaching and competitive sports that any kid had in Oakland, and they had that from the time they're in kindergarten or first grade," he said. Those playgrounds were filled with young, talented kids, many of them whose families were part of the Great Migration of African-American families who moved to Oakland from the South in the first half of the 20th century. Robinson and Flood were both born in Texas, and Russell was born in Louisiana. Brekke-Miesner remembers talking to John Brodie, a former MVP quarterback for the San Francisco 49ers, who played against Robinson, Russell and Flood when he was at Oakland Tech. "And he said you couldn't help but get better playing against that level of competition," Brekke-Miesner said. "So I think that was very significant in the development of Frank Robinson, not just the coaching but the kind of competition he was playing against every day in Oakland."